Take advantage of this one-day pass to visit Paris in total freedom and use our included admission ticket to visit the Musée d'Orsay whenever you like. 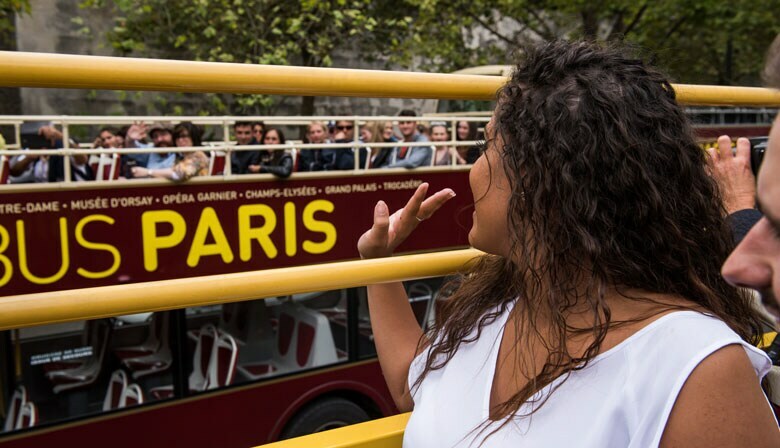 Big Bus offers two routes allowing you to explore the must-see sites of Paris. Aboard an open-top bus, you'll enjoy stunning views of Paris and discover the breathtaking beauty of this capital city. Hop on and hop off at any time at the different Big Bus stops located throughout Paris and spread over two distinct itineraries. The first "Red" tour will allow you to visit the historical city center where the major Paris landmarks and districts are located. With ten stops, you can go from one point to another without getting tired and explore the city at your own pace. The tour includes an admission ticket to the Musée d'Orsay, which you can easily visit by getting off at stop no. 7, located right in front of the Museum. Enjoy some time to discover the Musée d'Orsay. Housed in a former train station, the Musée d'Orsay is a magnificent setting to showcase the world's largest collection of impressionist and postimpressionist art work. Admire masterpieces such as "Le Moulin de la Galette" by Auguste Renoir, "Le Déjeuner sur l'herbe" [Luncheon on the Grass] by Edouard Manet, "Nuit étoilée " [Starry Night] by Vincent Van Gogh and "La Petite Danseuse de 14 Ans" [Little Dancer Aged Fourteen] by Edgar Degas. You can also take advantage of this break to visit other attractions near the Musée d'Orsay. In the Tuileries Gardens, which are typically in the French style and the oldest gardens in Paris, you'll find the Musée de l'Orangerie which houses the works of Picasso, Monet and Matisse. A little further away is the Musée Rodin which has exhibited the works of Auguste Rodin since 1919. From there you'll be able to see the Tour Montparnasse, which is the tallest skyscraper in Paris. If you wish, you can then continue your tour through Paris by taking the sightseeing bus on this same red route along the Seine. While listening to an audio commentary in the language of your choice, you can admire the architectural beauty of the buildings along the banks. You can visit other iconic Paris sites by getting off at any of the nine other stops. You can also set off to discover the bohemian neighborhood of Montmartre on the Big Bus "Blue" itinerary. This tour, which is smaller than the red route, allows you to travel through the Pigalle district or visit the Sacré-Coeur Basilica which rises up on the Butte Montmartre. - For security reasons, you must wait until the bus comes to a complete stop before getting on or off and it is strictly forbidden to lean against the railings of the vehicle. Your seatbelt must be fastened at all times when the bus is moving. - A complimentary poncho will be provided in the case of rain. - Out of respect for others, please do not throw anything inside or outside of the bus. - The itinerary is subject to change without notice in the case of an unexpected demonstration or special events (for example: the July 14 National Holiday, the arrival of the Tour de France). Tuesday, Wednesday, Friday, Saturday, and Sunday: 9:30 a.m.–6 p.m. Exhibit rooms being closing at 5 p.m.
Thursday: 9:30 a.m.–9:45 p.m. Exhibit rooms being closing at 9:15 p.m.
- The ticket is valid for one or two days, depending on the excursion chosen. No matter what time you start the tour, your ticket is valid for one or two days from the day you start the tour. - Complimentary headphones are provided with audio commentary available in 11 languages: French, English, Spanish, German, Italian, Russian, Portuguese, Japanese, Chinese, Korean and Arabic. https://play.google.com/store/apps/details?id=com.bigbustours.bbt This app will provide you with access to itineraries, schedules and stops based on your location. Once you have booked, you'll receive an e-ticket by email which you can then print out or present directly on your smartphone. The e-ticket can be redeemed directly on the bus. The day on which it is redeemed counts as the day of use (or the first day of use) of the pass. Present the email voucher to our PARISCityVISION agency to receive your admission ticket for the Musée d'Orsay. Geolocation app to help you better navigate through Paris. Admission ticket allowing you to explore the Musée d'Orsay at your own pace.